Place chocolate into a small bowl and heat over a small saucepan of barely simmering water or in a microwave and melt it until it is smooth. Let cool for 5 minutes. Place egg yolks and sugar in a large bowl and beat until you have a smooth paste. Add the coffee mix just to combine, and then stir in the melted chocolate. Add the olive oil and mix well. The mixture will be glossy and smooth. In another large bowl beat the egg whites until stiff but still a little wet, leaving soft peaks. Using a balloon whisk, gently fold one third of the egg whites into the chocolate mixture and whisk until patches of white disappear. You don’t have to be too careful at this stage, it’s simply to loosen the mixture. Add the remaining egg whites into the chocolate mixture, softly with a large metal spoon to gently fold in the mixture until all the patches of egg white disappears. Gently spoon the mousse to the desired serving bowl and refrigerate until set, for at least two hours. 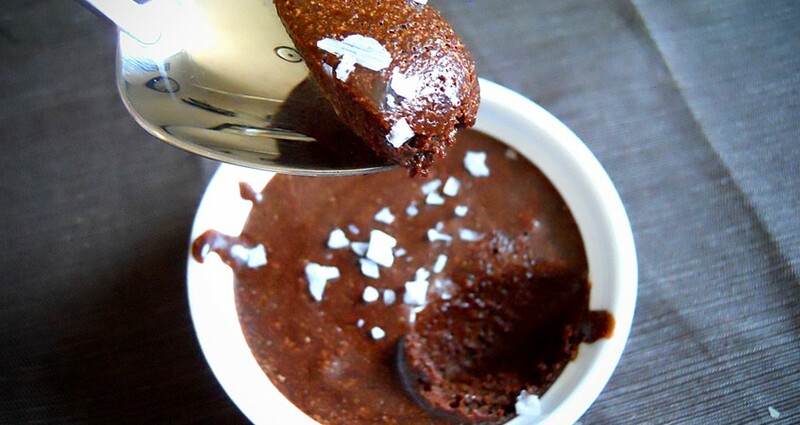 To serve sprinkle with a small pinch of salt and serve before salt melts into the chocolate.